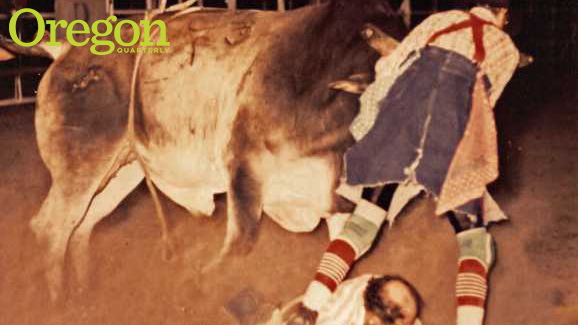 It doesn't get much more primal than going one on one with a raging, 2,000-pound bull, as described below in two excerpts adapted from My Best Mormon Life (CreateSpace, 2012), a memoir by Jesse Ellison, JD '05. The book covers Ellison's youth in Blackfoot, Idaho, his education at Brigham Young University and Harvard Divinity School, and his Mormon proselytizing mission in Atlanta, Georgia. Ellison is an attorney in Missoula, Montana. Here, the term "bullfighter" does not refer to a matador, but to what is commonly called a rodeo clown. When my brothers Jeremy and Josh started riding bulls my father started fighting them. In his mid-forties he learned like other novices, attending schools, working amateur shows, and studying tape, but unlike most of his bullfighting peers he got into ironman shape. The three of them attended all-around professional cowboy champion Lyle Sankey's school, my father spending each evening soaking in the tub after getting trampled on the first day. Every bull rider gets run over by a bull during his career, and bullfighters do, too, and my father completed that rite at the school long before he fought at his first show. He took physical fitness seriously his entire life, and his commitment increased when he began putting on cleats, and hip and rib pads, to step between bulls and the riders. A 40-year-old bullfighter was an anomaly. Heavens, there was probably a 50-year-old fighting bulls at shows somewhere in the Badlands of South Dakota, but we didn't know of anyone close to 50 except Pops fighting them in Idaho. His first official shows were as one of the bullfighters at junior rodeos where my brothers got their starts traveling around small Idaho towns the summers during junior high and early high school. Rodeo people knew our name as much for the old bullfighter as the young bull riders. My father's life as dentist by day and bullfighter on Saturday afternoons during the spring and summer reached its culmination at two professional events, the Professional Old Timers Rodeo Association show in Blackfoot two summers in a row. The legendary Montanan Ronnie Rawson entered the Old Timers Show at Blackfoot both years my father fought it. Rawson was legendary not merely for his two bull-riding world titles won in the '60s or for the seven bull-riding titles won on the senior tour, but also for the 53-year-old's being the epitome of tough. He broke his jaw his first year at the National Finals Rodeo, had it wired, and continued competing, and his career followed suit. For generations of bull riders, Rawson was synonymous with the meaning of "cowboy up." He arrived at the show in Blackfoot banged up, years of injuries having made him more cautious. He drew the bull Tressbraker, a powerful brindle, one of the stock contractor's rankest. He inquired about the bull, and the contractors assured him he would be fine, as numerous high school kids had been on him. Rawson had been in the game long enough to know stock contractors had common interests with bull riders, but not the same interests. Both wanted a bull that would buck, but the rider wanted one that would result in a high score and the contractor wanted one to eject and trample the rider for good measure. Looking for an objective view, Rawson asked my father what he thought about Tressbraker. Never shy to tell the truth despite backlash, my father told Rawson plenty of high school bull riders had got on, but he never saw one ride him, adding he was the rankest in the pen. Rawson chose not to ride that night. The contractor confronted my father, beside himself with anger a bullfighter would think it his job to dissuade a bull rider from getting on one of his bulls. The next summer Rawson climbed on and won the bull riding at Blackfoot. He fell off in front of the bull's head, and my father moved in between the bull and Rawson, diverting the bull's attention and averting a likely trampling. A small framed picture of Rawson, hatless and balding at 54, sprawled on the ground beneath the bull with my father in full bullfighter's attire reaching for the bull's head [shown above], sits next to the unchristened silver beer mug commemorating my father's commission as an officer in the Marine Corps. They are nestled among other mementos and nearly hidden in his closet. Saving Rawson was his job, nothing special, but extraordinary. Bull riders knew Rawson because he was tough, but they also knew him because of his character, central to one of the most well-known stories of rodeo lore. Rawson ran a bull-riding school, like many former world champions did, and a young boy was killed there. Rawson sold all that he had, gave it to the boy's family, and hit the road, leaving many to speculate the boy's death was the reason for his inimitable extended bull-riding career. A month after winning the Blackfoot show, Rawson made another winning ride at an Old Timer's show in Rocky Ford, Colorado. He dismounted, and the bull kicked him in the chest. Two hours later Rawson died. Few lived like Rawson, doing what they loved for so long and doing it the best. The Blackfoot Fairgrounds, home to the Eastern Idaho State Fair, had bleachers rising over an elliptical arena with freshly groomed dirt. The bleachers faced bucking chutes, with the announcer's booth above them. I sat in the bleachers and could see my brother Josh sitting on the bull setting his rope. Since my first rodeo, I opted for holding my breath for run-on prayers from when the bulls ran into the chutes to my brothers' running from the arena. I never made a more sincere plea to God throughout my life than to help keep them safe, and if it humored him to help them ride well. The chute-help popped the gate and swung it open, and a large black bull lunged out with Josh fixed on it. The bull lunged from side to side without committing to turn back, not spinning (a bull that spins is hard to ride and fun to watch and more likely to produce a high score), fading to the right then making a strong move to the left that whipped Josh down onto the bull's head, knocking him silly, if not out. His body fell to the right with his left hand still in his rope. A bull rider with his hand caught in the rope was said to be hung up. Damn accurate. No bull rider wanted to be hung up, but when he was, the foremost rule was to stay on his feet. Half unconscious, Josh flipped atop the bull to his side. The bull threw his head back, hitting Josh's flimsy body; Josh slipped under the bull, and the bull's strong hooves stepped over and over Josh's body. The bullfighters leapt onto the bull trying to free Josh's hand, one moving in on the bull and twirling around with only a second to reach for Josh's tied hand before the back end of the bull swung around and bounced him off to the ground. My father jumped over the chutes and headed at the bull, jumping at its back for Josh's hand, but bouncing off unsuccessful like the others. An eternity of seconds passed with the bell on Josh's bull rope heard deep into the sky when a chute-helper jumped on Josh's tied arm, wrenching it from the rope and bull. Josh lay in the arena for minutes until the medics carted him away to an ambulance headed to the hospital.